A stay at Best Western Plus Aberdeen places you in the heart of Aberdeen, within a 15-minute walk of Morrison Riverfront Park and Aberdeen Museum of History. 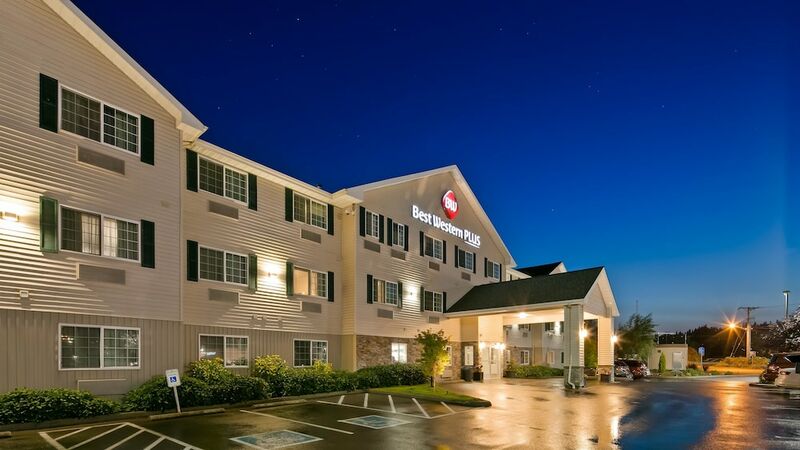 This hotel is 25.4 mi (40.8 km) from Ocean Shores Beach and 1.1 mi (1.7 km) from Kurt Cobain Riverfront Park. Make yourself at home in one of the 87 air-conditioned rooms featuring refrigerators and microwaves. LCD televisions with cable programming provide entertainment, while complimentary wireless Internet access keeps you connected. Private bathrooms with shower/tub combinations feature complimentary toiletries and hair dryers. Conveniences include phones, as well as desks and coffee/tea makers. Featured amenities include a business center, complimentary newspapers in the lobby, and a 24-hour front desk. Planning an event in Aberdeen? This hotel features 600 square feet (56 square meters) of event facilities. Free self parking is available onsite. In addition to an indoor pool, Best Western Plus Aberdeen provides a spa tub and a fitness center. Public areas are equipped with complimentary wireless Internet access. A business center is on site. Guests can enjoy a complimentary breakfast. Event facilities measure 600 square feet (56 square meters). This business-friendly hotel also offers complimentary newspapers in the lobby, laundry facilities, and a safe deposit box at the front desk. Onsite self parking is complimentary. Best Western Plus Aberdeen is a smoke-free property.